Expertly faceted round brilliant cut, 6.5mm. Diamond Equivalent Weight (DEW) 1.19 carats. 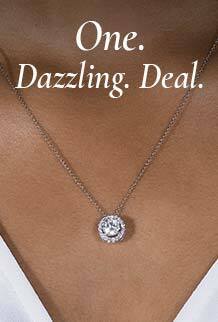 A 6.50mm round brilliant moissanite sits at the center nestled by a sparkling halo of accent gems setting this pendant necklace all aglow. Crafted in exquisite 14k white gold and carrying a total diamond equivalent weight of 1.19ct, it hangs gracefully from a delicate chain.